The all-new 2019 Ascent will be the first Subaru ever to come standard with EyeSight Driver Assist Technology, but what does that mean for consumers? The new Ascent 3-Row family hauler will feature a host of safety tech you may not have heard of like Automatic Pre-Collision Braking, Adaptive Cruise Control, Lane Departure and Sway Warning, Pre-Collision Throttle Management. How do these systems work and how will it benefit consumers? Subaru EyeSight features four main safety systems that are designed to prevent accidents from occurring. These scenarios can happen every day as consumers commute in city traffic. The first system is called Pre-Collision Braking. A driver ahead unexpectedly hits the brakes or cuts you off. EyeSight warns you, applies brakes to help avoid impact and, at lower speeds, can even help stop the Subaru Ascent. The Ascent will come with this safety technology that could prevent a head-on collision. It happens when a driver is not alert and accidentally drifts to the edge of the lane and begins to cross into another. EyeSight’s radar cameras watch for lane markers and chimes to warn you before you leave your lane, and it can even help steer you back into your proper course, thanks to Lane Keep Assist. When a driver is in heavy stop-and-go traffic, it’s easy to look down and be distracted. Ascent features Adaptive Cruise Control allowing the driver to maintain a constant distance and speed. 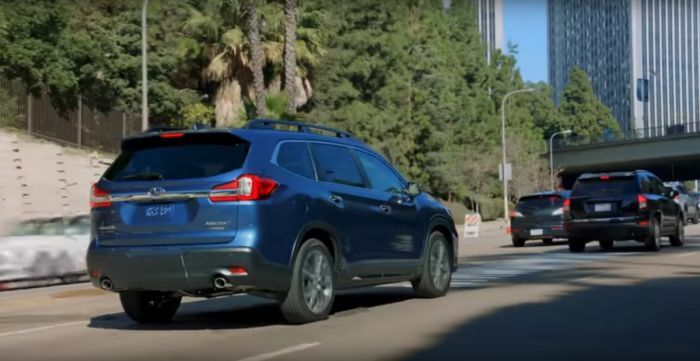 When traffic isn’t flowing smoothly, EyeSight keeps a set speed, and the system also looks ahead and helps the Subaru Ascent automatically adjust to keep your distance, even in stop-and-go traffic. It could help prevent a rear-end collision. It’s easy to think you’ve put the car in Drive instead of Reverse and end up hitting something in front of you. This safety system sees an object in your path and cuts power to help you avoid accelerating into it. The new Ascent SUV will also come standard with new EyeSight Assist Monitor (EAM) which provides a heads-up display of the EyeSight system warnings as well as system status information on the windshield of the vehicle. Subaru’s goal to be the number one brand for overall safety will be accomplished with the further enhancement of its EyeSight driver assist system. The new 2019 Subaru Ascent 3-Row family hauler will feature the latest safety technologies which could make it the safest SUV on the planet. The new Ascent will arrive in showrooms this spring.